On a chilly April morning in 2016, at a newly converted shelter in southern Berlin, Om Belal struggled as she maneuvered her ten-year-old son, Jad, in his wheelchair out the building’s front door. They were on their way to see a pediatrician, to begin the process of assessing whether Jad would ever walk again. Once outside, she carefully eased Jad backward down the front steps, then hurried awkwardly across the street, the wheelchair rattling along: One of its back wheels was leaking air. Om Belal had meant to have it fixed that morning, but she didn’t speak German or English, and she couldn’t find any of the shelter’s Arabic-speaking staffers to ask for help. Communicating with them was pointless otherwise. A year and a half before, Jad had been playing with friends near his home in Maarrat Misrin, Syria, when a stray bullet from nearby fighting sliced through his spinal cord. Om Belal and her husband, Najy Sawan, took their son to a hospital in Antakya, Turkey, where he spent a month in intensive care. (Hospitals in northern Syria are so poorly equipped, if even functioning, that it is common for Syrians to seek treatment just across the border in Turkey.) Doctors told Najy and Om Belal that Jad would need extensive physical therapy if he were ever to walk again— treatment the hospital couldn’t provide. The Sawans returned to Syria. Najy and Om Belal were at a loss for what to do. With the news of so many of their fellow Syrians fleeing the country, seeking to restart their lives in Germany and Belgium and Sweden, they decided their best chances for Jad’s recovery were somewhere in Europe. At the bus stop on Groß-Berliner Damm, Jad was quiet and still, a blank expression on his face. His parents had been watching his body grow more fragile by the month, his limbs thinning. Om Belal adjusted the blankets on Jad’s lap to keep him warm. After a few minutes, the bus arrived, and Om Belal hoisted the wheelchair onboard, eyeing the other passengers, who’d kept their seats. (One thing that had stood out to her was how Berliners were reluctant to lend strangers a hand; Syrians tended to be much more obliging.) Once settled, Jad began to perk up, concentrating on the faces around him. Soon we disembarked at the Schöneweide station. The bus driver waited an extra moment as Om Belal backed the chair off the bus, lifting it slightly, then lowering it down onto the sidewalk. She paused to get her bearings, then headed east. The wheelchair’s tire was flat by now, and the chair wobbled and lurched along the sidewalks and cobblestone streets. But Om Belal pushed on with constancy, a mother determined. We arrived, finally, at the address the shelter had provided, an anonymous, concrete medical center. The waiting room was busy with mothers and children. Heat blasted from the vents. Om Belal guided Jad to a corner and sat beside him, then began scanning the other women: One wore a black tank top that revealed tattoo-covered skin; another had purple hair and a pierced septum. Om Belal made sure not to stare for too long, and instead focused on Jad, who was quiet, his gaze averted, as if folding into himself. The receptionist didn’t speak Arabic, so I inquired on Om Belal’s behalf. “Jad has an appointment,” I said, handing over his documents. The receptionist asked for his green card, but Jad hadn’t received one yet. That same morning, Najy was at LAGeSo (officially, the State Office for Health and Social Affairs), the refugee processing center crowded day and night with asylum seekers, where he was trying to obtain the documents that would allow Jad to see a doctor. The Sawans did not exactly understand at which step in their asylum process they would receive their green cards, nor how long it would take. In the meantime, Om Belal and Najy decided to take their chances without proper documentation, assuming that if the shelter had arranged the appointment then Jad stood a good chance of being seen. Entanglements with bureaucracy are a common experience for newcomers in Berlin. For refugees—whose daily life requires even more papers, signatures, and registrations—it is a dizzying, protracted nightmare. By the time Jad made it to his appointment, Najy had been waiting at LAGeSo for days on end, with appointments turning into postponements regularly. “Unfortunately, it’s not possible for him to see the doctor without a green card,” the receptionist said. Om Belal did not protest, only packed up her purse to leave. By now she’d learned that it was futile to try to circumvent the rules and protocols of life in Berlin. Back on the cobblestone street, she held back tears while walking with more purpose, her chin higher. “We have gone to so many places, so many,” she said, her voice rising with frustration, “and we never know what’s going on.” Jad bounced around in the chair, but Om Belal was pushing as fast as she could now. The leaky tire had become an afterthought. “I want Jad to get better before he goes to school here,” she added. A train passed on a bridge overhead—the S-Bahn, a commuter line, headed south. Jad smiled for the first time that afternoon, delighted by the sight of the wondrous machine, which he’d never even seen before leaving Syria. The story of the Sawan family—Najy, Om Belal, their son, Jad, and daughters Maria and Zahra—would seem remarkable if not for the astonishing number of family sagas that resemble it. According to Germany’s interior ministry, nearly 900,000 people entered the country seeking either asylum or economic opportunity in 2015. Germany was the most popular destination for asylum seekers that year (in the fall, some 10,000 people crossed the country’s borders daily, mostly in the south via public transportation to Munich). Part of its popularity was a strong economy that had long attracted immigrants. However, the government had announced in August that it would allow an exception for Syrians with regard to the Dublin Regulation, a European Union law stipulating that asylum seekers must apply for asylum in the first EU country they enter without authorization (which in most cases means Greece, Spain, or Italy). That announcement was misinterpreted by many refugees to mean that Germany’s door was open to everyone. Even after the government rescinded its announcement, Germany nonetheless remained a symbol of a better future, making it all but impossible to curb the waves of migrants seeking to pursue that promise within its borders. The new arrivals were distributed among refugee shelters across Germany, some assigned to live in cities, others in the countryside, wherever Germany could find space to put them. The process was backlogged and laborious, its rules opaque. Obtaining asylum approval could take a year if not more, and often the only thing that made the process of beginning a new life here slightly less maddening was if you were lucky enough to meet a German who would guide you along the way. In the meantime, asylum seekers had to navigate even more bureaucratic hurdles if they were to find employment, or even register for a language course, let alone enroll at a school or university. Germany’s Federal Office for Migration and Refugees estimates that about 141,000 people were granted refugee status in 2015—with 433,920 more accepted in 2016, leaving another 433,719 people somewhere in the process. Many of those who were denied asylum came from the Balkans, swept up in the great migration northward among the Syrians, Iraqis, Afghans, and Iranians. (Nearly half of all Iranians and Afghans were denied asylum as well.) Those who did not receive refugee or another form of protected status risked deportation back to their home country. Appealing a negative decision could prolong a case for a while, allowing for a little more time, but in 2016 the German government had begun to streamline the deportation of failed asylum seekers, such that it had deported about 25,000 migrants by the end of the year. In addition, an estimated 55,000 migrants left Germany voluntarily that year. The Sawans were just one of countless families caught in this epic dilemma. Jad was their impetus to pressing through the asylum process, which meant nights spent waiting in line at LAGeSo, among other sacrifices. Najy made a point of telling me early in our first meeting that his family had only come to Germany for Jad’s sake. They didn’t flee Syria because they were afraid of the war; they fled so Jad could see a doctor who could help him. This was the family’s mantra. What they had not anticipated was everything else that came with the refugee experience: the loss of independence, the lack of privacy, and the perpetual state of waiting for an outside power to dictate how and when they could begin their lives again. The Sawans’ room at the shelter in Niederschöneweide was an austere space that measured twenty-by-twenty feet, with just enough room for a bunk bed, a double bed, and a small table. There was a closet, as well as a private bathroom—a luxury they were provided because of Jad. The plywood furniture seemed hastily thrown together, reminiscent of a college dorm. The day I visited, most of their belongings were piled in a corner. Jad was lying on the lower half of the bunk bed and hardly stirred. His older sister, Maria, was sleeping through the afternoon on the bunk above him, while his younger sister, Zahra, bounced around the room, dressing up in clothes and jewelry that were too big for a four-year-old. Najy was plainspoken, with rigid mannerisms that had the formality of a diplomat as he described his family’s experience getting to Germany. Om Belal had an older son, Belal, from an earlier marriage (Syrian women are customarily known by the first name of their firstborn son; “Om” means mother), who had migrated to Europe in the summer of 2015, via the smugglers’ route from Turkey to Greece across the Mediterranean Sea. 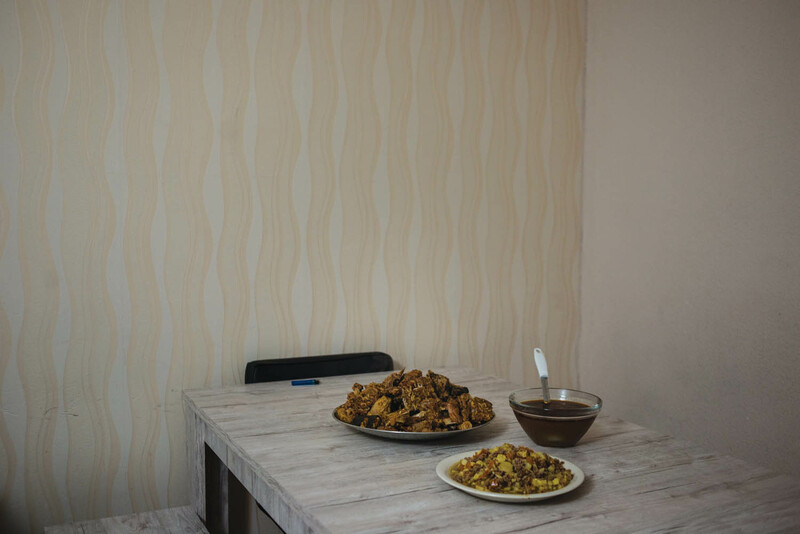 The Sawans had hoped that Belal would receive residency in Germany as a refugee, then apply for the rest of them to join him through a family-reunification visa, which would have spared them the treacherous crossing by sea. But months passed without any sign of progress. As Bashar Assad’s government intensified its attack on rebels in northern Syria, the Sawans lived under the relentless threat of air strikes and sporadic infighting among the rebels who controlled the region. Meanwhile, Jad’s health deteriorated: Paralysis had taken root in his upper body, and his muscles had atrophied so that he could hardly move by himself. They were running out of time. 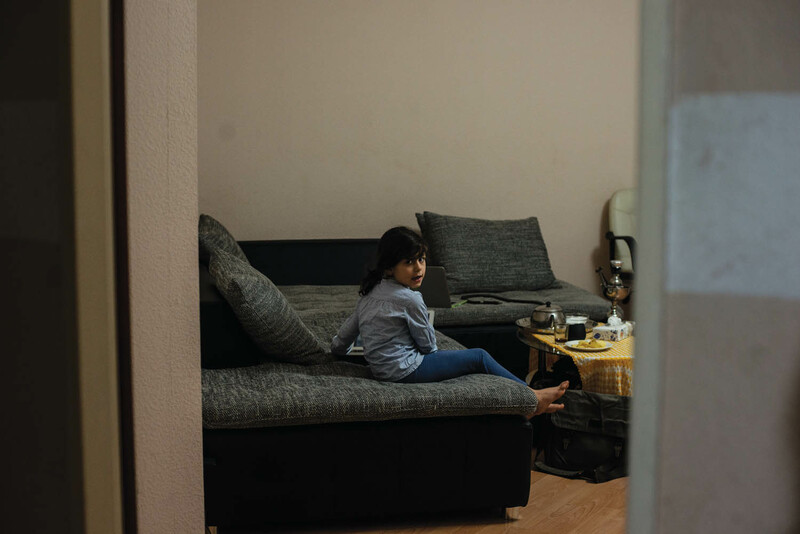 With the help of Najy’s friends, the family connected with smugglers, then made their way to the Turkish coastal city of Izmir. They arrived in a neighborhood frenetic with people desperate to reach Europe and others primed to exploit them. Najy spoke with more smugglers there. Visiting a launch point on the coast, Najy watched as men, women, and children crammed onto dinghies well beyond their capacity. He began having doubts about whether they’d survive such a crossing. The family stayed at small hotel nearby, hoping the crowds would dissipate, even if just a little. “We realized waiting was no use,” Najy said. The dinghies would always be full, always a risk, and the only way out. After a week in Izmir, smugglers led the Sawans to a spot on the coast outside the city, where they joined fifty strangers waiting to board a vessel bobbing in the water, more raft than boat. As his wife and daughters climbed aboard, Najy lifted Jad out of his wheelchair, cradled him in his arms, and settled next to his wife. “We left the wheelchair in Turkey,” he said. As the dinghy set out, Najy clung to his son, who was too weak to hold on by himself. The passengers focused on staying calm, on keeping still lest they cause the craft to capsize. Then, an hour into the journey, the motor died, and panic began to set in. A couple of passengers banged on the motor to try and knock it back to life. (“The smuggler told us that the motor was Japanese, but it turned out to be Chinese,” Najy recounted, with no small dose of indignation.) The passengers began praying together. Even Najy, who wasn’t prone to big displays of emotion, feared for his life. Finally the motor sputtered and started up again, and an hour later the boat landed at the Greek island of Lesbos. The Sawans scrambled onto shore, then walked three miles, with Jad in Najy’s arms, to the town of Mitilini, where they happened upon a charity organization that gave them a wheelchair to replace the one they’d left behind. Lesbos was a chaotic scene, a swarm of migrants and aid workers and volunteers. The Sawans had no plans for what to do next. They noticed a large group setting off by ferry for Athens and decided to join them—bound northward for Europe, never sure of exactly where they were or who was leading them. It was “train and bus and train and bus,” Om Belal recalled. 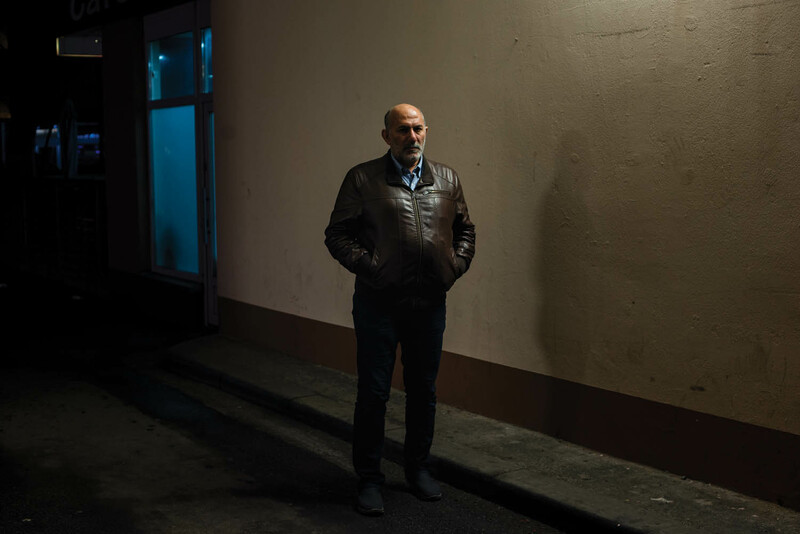 From Syria to Germany, the journey cost them $10,000, some of it in cash Najy kept stuffed in his jacket, and some sent by family members along the way through Western Union transfers. I wondered if, after all they had endured to get here, they intended to return to Syria at the end of the war. Najy sat even taller than usual at the question, his answer firm. “We will go back when Jad walks,” he said. By May 2016, the Sawans’ circumstances were improving. Jad had been admitted to a children’s neurological center in nearby Brandenburg, with the German government agreeing to cover his medical care. The family had received their green cards, a critical step to eventually receiving asylum. Maria, meanwhile, was on a waiting list to begin free German-language classes. Yet Om Belal was still distraught: She thought they would have achieved some semblance of normalcy by now—at least as much as could be expected—but her life still felt outside her control. She had no routine, and Jad’s condition hadn’t improved as much as she’d hoped. Her weariness weighed down any joy from the fact that Jad was finally receiving the care he needed. Sitting at the small table in their room at the shelter, she lit a cigarette and stared at the shuttered window. “Germany has made me start smoking,” she said. For her, the days still revolved around the process of settling in. “I’ll go stand in line at LAGeSo starting at 4 a.m., and then all they do is give you your money”—about $125 a month for Najy and Om Belal, and $80 for each child. The money was, of course, important, but she needed help finding an apartment, and to know exactly when Maria could begin school. She also wanted to study German, but there was limited space in classes for asylum seekers who had yet to receive residency visas. (There was a threefold increase in demand for language courses for those already granted asylum from 2015 to 2016.) Plus registering for classes involved more documents and more waiting. She had gone through the trouble for Maria, but was wary of doing so again for herself. I reminded her that Germany provided many social services to refugees as well as to its own citizens—more than in the United States. She nodded; it was just the shelter that had worn her down. Sick of the food, sick of feeling like her life was not her own. The more we talked, the more her words raced together. Everything she disliked about Germany spilled out in a litany of grief: People weren’t friendly. Maria was falling behind in her education. Worse, Jad had been showing signs of post-traumatic stress disorder, waking from nightmares and crying whenever Najy left his side. Last New Year’s Eve, when Berliners shot fireworks in every direction, Jad went into a panic, terrified by the noises. As Om Belal talked, Maria and Zahra were snuggled on the bottom bunk of the bed, watching a Syrian soap opera on a cell phone. Maria got up and walked to the other side of the room, where she sat in front of a full-length mirror and began to pick at her face. She rarely left this room, knew no one else in Berlin, and until a space opened up for her in language classes, she had nowhere to go. After a few minutes she shuffled back over to the bed to sleep. I asked Om Belal if she still had family in Syria. Talking about them seemed to lift her spirits a little. “Najy comes from farmers, but my family was a well-known merchant family in town,” she said, and then delivered an abridged account of her lineage, populated with grandfathers and great-uncles. There were names and histories that were hard for me to follow, but Om Belal recounted them with an explanatory tone that was laced with pride. Then she paused, and looked at me with a grave expression. “They would rather die in Syria than leave,” she said, clearly admiring their commitment. There was a knock at the door. Om Belal threw on a robe and headscarf before answering, then opened it ever so slightly. Outside stood one of the shelter’s employees, who informed her in English that the kitchen was missing some dishes, and that he’d come to inspect their room to see if they were hiding any. Om Belal looked back at me, confused, and so I translated his concerns into Arabic. The employee gestured that he wanted to enter, and with a solemn expression Om Belal opened the door a bit wider. I looked around and suddenly noticed the stack of dishes at their bedside, a bowl filled to the brim with yogurt resting on the windowsill. The man strode past Zahra and Maria, who watched silently from the bunk bed, the contraband in full view. “This is not allowed,” the man said to Om Belal. In the Arab world, “not allowed” could be interpreted as sometimes permitted, which is why she thought she could get away with hoarding the bowls without bothering to ask in the first place. She reluctantly gathered the bowls, leaving only the one filled with yogurt. “You need to take that one to the kitchen, too,” the man said. Om Belal stared at the floor and nodded as he turned on his heels and left. The hospital where Jad was receiving care was the last stop on the bus line from Brandenburg’s central station. It was nowhere in particular, surrounded by dry fields, patches of woods, and abandoned Soviet public infrastructure. For Najy and Om Belal, it was a big step toward healing and validation. Outside the hospital, patients and visitors stood or sat in wheelchairs smoking cigarettes in the warm but sunless July afternoon. A few paces down an unadorned hallway was Jad’s room: drab, beige walls, with a German flag hanging from a cabinet and tall windows overlooking the parking lot. His bed was pressed against the wall. He still couldn’t move below the waist and lacked the power to sit up by himself and interact with others. Najy had been spending nights here, sleeping on a wood chair. I asked him how they were all faring. He brushed it off. “We went to a lot of doctors and got a lot of documents,” he said, then changed the subject to the US government’s relationship with the Arab world and the upcoming US election. Every time I asked him about their life in Berlin, he shifted, asking me about AIPAC, the pro-Israel lobby in Washington, DC, or telling me about the history of his beloved olive trees from the rolling hills of his homeland in Idlib province. He showed me their photos again; I repeated the same compliment as before, telling him they were impressive. It felt as if he needed some kind of vague affirmation. It wasn’t clear if he knew Jad’s prognosis or if he was avoiding talking about it. Basic details, like how long they were expected to be in the hospital, eluded him. “We found an apartment,” he added, almost offhandedly. Their new neighborhood, Gesundbrunnen, was a neighborhood in northwest Berlin not far from Tegel Airport, home to a large Arab population. There were other signs of progress: A doctor had told the Sawans that a back brace might help Jad regain movement in his lower body (the brace cost around $10,500, though it was possible that the German government would pay for it). It was cause for at least a little optimism, to be sure, and yet when Najy spoke he sounded dejected. Najy, who had once declared triumphantly that Jad would walk again, seemed to have morphed into a man who had lost his footing. “Did you hear about the terrorist attack in Munich?” he asked, switching subjects again, this time to a few days earlier, when a German Iranian had opened fire in a shopping mall, killing nine. “Thank God he wasn’t a Muslim,” he said, not considering an Iranian, who likely belonged to the Shia sect of Islam, a Muslim. “It’s a very weird thing when I tell a German that I am Muslim, and they assume that I am with ISIS,” Najy continued. “It’s ignorance.” Like Om Belal had done two months earlier, Najy began listing his grievances with German culture. He complained about a time he was scolded for being five minutes late to a meeting, which he thought was unnecessary. He found it disgusting that Germans brought their dogs into cafés. He wasn’t as upset as Om Belal was by these cultural differences; rather, he was simply sharing his assessments, curious to gauge my response as an American. It seemed he was merely listening to himself talk. “They’re very direct, these Germans, huh?” he asked before moving on to his next story. The topics blurred one into the other, a monologue of someone who needed to be heard. Left with no community, no job, and little autonomy on a new continent that he believed didn’t want him, at least Najy still had his opinions. And so he droned on, only not about the condition of his son. The names on the buzzers at the apartment complex in Gesundbrunnen were almost exclusively Turkish or Arab. The Sawans lived on the sixth floor, in a three-bedroom apartment that overlooked the sprawling city. The February night was cold and still and quiet. Once buzzed into the building, I walked through hallways filled with the rich scents of spiced lamb, fried onions, and cumin. Turkish graffitii was scratched onto the walls, and a layer of dirt covered the floor, the shared areas of the building being much more poorly tended than the shelter. Most of the Sawans’ $1,300 monthly rent was covered by the German government, with the Sawans contributing about $100, which they drew from their monthly stipend of nearly $1,400. The impressive sum was meant to cover all of the Sawans’ living expenses, since no one in the family earned a salary, an example of Germany’s expansive social-security net. 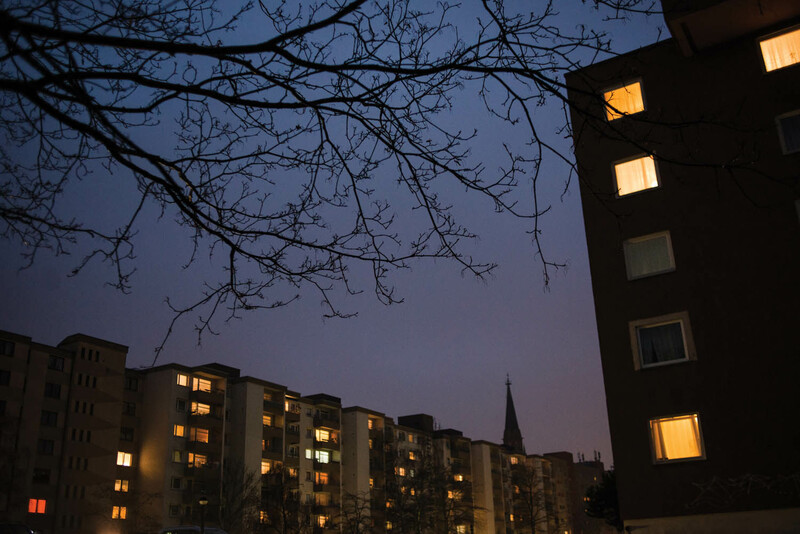 Around 450,000 refugees were receiving some form of welfare in February 2017, according to a spokesperson for the Federal Agency for Work, though not all monthly stipends are as high as the Sawans’, which accounted for the family’s lack of income. Germany’s federal government spent around $23 billion on refugees and asylum seekers in 2016, a figure that by 2020 is expected to grow to around $99 billion, according to the country’s finance ministry. The Sawans were expected to report to authorities if their financial status changed. Until then, their circumstances would be reevaluated anually in order to gauge if their stipend needed any adjustments. Najy and Om Belal were out of the apartment for the afternoon, and they had told Maria and Jad that I might arrive before they made it back. A quick knock on the door and Maria ushered me inside, greeting me with two pecks on the cheek. Jad emerged from behind his sister in a new, bigger wheelchair and held out his hand for a shake. Zahra was dozing in her bedroom, Maria said, before showing me around their new home. It seemed rather bare aside from a few critical furnishings. But it was their own. There was good news to share: Jad had been enrolled in a school in Wittenau for handicapped children, with classes beginning in winter. He’d been able to study German during his stay at the hospital, and could now manage basic conversation in the language. He seemed energetic and animated, wheeling himself from room to room. He pulled up to the sofa and dug around for the remote, found it, and switched on the television. As he flipped through the stations, we talked about simple things: Real Madrid, PlayStation, his distaste for German food. Maria was chatty. She proudly told me she’d passed the first level of her German-language classes after three months. “The class is half boys and half girls,” she said. “There are a lot of Syrians, and when we’re not in class, we just speak Arabic together. It’s bad for learning, but it’s okay.” More important, she was looking forward to starting high school in the fall. Om Belal walked in, home from a trip to the market. “Jad can lift himself up from the chair and move onto the couch!” she told me excitedly. “He does exercises every day that he learned to do in the hospital. It’s helping.” As for the back brace, the German government had declined to offer any financial assistance for it, so the family was on the lookout for a charity organization that could help them afford it. A couple of hours later, Najy returned from job hunting in the nearby neighborhood of Wedding. Though he was looking for employment, he said he’d much rather work for himself—to freelance, perhaps, as a driver or in construction. “It’s so much better than just being an employee,” he said. The pretense he once used, that he’d left Syria only for the sake of his son, had vanished. Now he spoke of the brutality of the war in northern Syria, of how the whole family would have been killed if they’d stayed in Maarrat Misrin. Before, I had heard him utter the Arabic phrase inshallah, or God willing, incessantly: inshallah Jad will walk…inshallah we will find an apartment…inshallah Maria can start studying soon. Inshallah is born from hope, but also worry, when it feels as if only a higher power can steer one’s life out of its current troubles. On this visit, I heard more alhamdullahs from the Sawans—praise be to God—because their lives had changed course. It was difficult to say how much hope Najy was holding out for Jad to walk again, but if he’d resigned himself to the circumstances, he’d done so with grace, knowing they could have been much worse. There was, however, something that did concern him. The Sawans had been granted subsidiary protection by the German government, not official asylum, which only allowed for a one-year residence visa. After a change to its refugee law in March 2016, Germany had begun issuing significantly more subsidiary-protection visas to Syrians based on the criteria that they were threatened by civil war, not individual persecution. If the situation in Syria remained dire, the Sawans could conceivably extend their residencies, with the possibility of acquiring more permanent settlement permits after five years if they could pass German-language exams and were not completely financially dependent on the state. But Najy didn’t understand all the details of how and when they would be given more permanent visas. A residence visa that only lasted for one year made him nervous. The expectation that Berlin may not be their permanent home, or even all that long-term, was an anxious undercurrent of sorts. “You know what’s going to happen if I go home,” Najy said. “The regime will kill me—and not just me, they will kill my wife and my children, too. And they only gave us one-year visas!” It seemed unfair to him. He knew of Syrian families who’d been granted asylum and given three-year visas—some of whom had come from the capital, Damascus, not the north, where the war had been much more destructive. Under subsidiary protection, the Sawans weren’t entitled to family reunification—in other words, applying for visas for extended family members outside of Germany, which would have been possible had they been granted asylum. As Najy and I spoke of other inconsistencies he saw in the asylum process—why some are ushered through quickly and others wait a year for asylum decisions—Om Belal walked into the living room to say that dinner was almost ready. I followed her back into the kitchen and was handed a stack of plates to set the table while she and Maria finished cooking. Back in the living room, Zahra was now awake and full of energy, laughing as she skidded back and forth across the floor in her socks. The boys were lost in screens—Jad flipping channels, Najy engrossed in his phone. Finally the food came out, and we took our places at the table, then set upon a feast of cheeseburgers, spaghetti, salad, and grilled chicken. The adults did, anyway; the kids were harder to rally: Jad stayed glued to the television, distracted, while Maria merely poked at her food and Zahra ate only her spaghetti before they both lost patience with the formality of the meal. And off they went. As we ate, Najy quietly recounted his day to his wife, reaching across the table, refilling his plate and insisting he do the same to mine as well. Om Belal called out to Jad asking if he was hungry. He gave a subtle nod, tossed the remote onto the sofa, then rolled up to his usual spot at the table. This article is part of a special project on Europe’s migration crisis, Paths to Refuge, which appears in the Spring 2017 issue. Reporting for this story was supported by a grant from the Pulitzer Center on Crisis Reporting. Laura Kasinof is a freelance journalist and author of the memoir Don’t Be Afraid of the Bullets: An Accidental War Correspondent in Yemen (Arcade, 2014), about reporting for the New York Times during the Arab Spring. She has also written for Harper’s, the Atlantic, Newsweek, and Foreign Policy. Alex Potter is a photographer based in the Middle East and the Midwest. In 2012, she was selected as a Rotary Ambassadorial Scholar to Lebanon. She is a recipient of a Chris Hondros Student Fellowship, as well as a Lucie Foundation Emerging Scholarship from 2012–2014. Her work has been recognized by PDN Photo Annual and American Photography, among others. George Butler is an award-winning artist and illustrator. His drawings, done in situ, are in pen, ink, and watercolor. In August 2012 George walked from Turkey across the border into Syria, where as guest of the rebel Free Syrian Army he drew the civil war–damaged, small and empty town of Azaz. Six months later he made a similar trip back to Syria to record the stories of refugees in the field hospitals and escaping the conflict. His drawings have been published by the Times (London), the New York Times, the Guardian, BBC, CNN, Der Spiegel, ARD, and NPR. Why did he so focus on AIPAC? Nice report. I empathize with the situation of this family, and I agree that the arbitratriness of the asylum process is a serious problem. However, I think that they hardly have the right to complain about how they are treated in Germany while receiving almost 2,700$ a month. Saying that "there is more respect" in other countries seems to me like a blatant disrespect to the country that has sheltered them and provides their livelihood.